Eco-Friendly, Stress Busting, Cost Effective G-Bike - Out Now! So, just what is an electric bike? 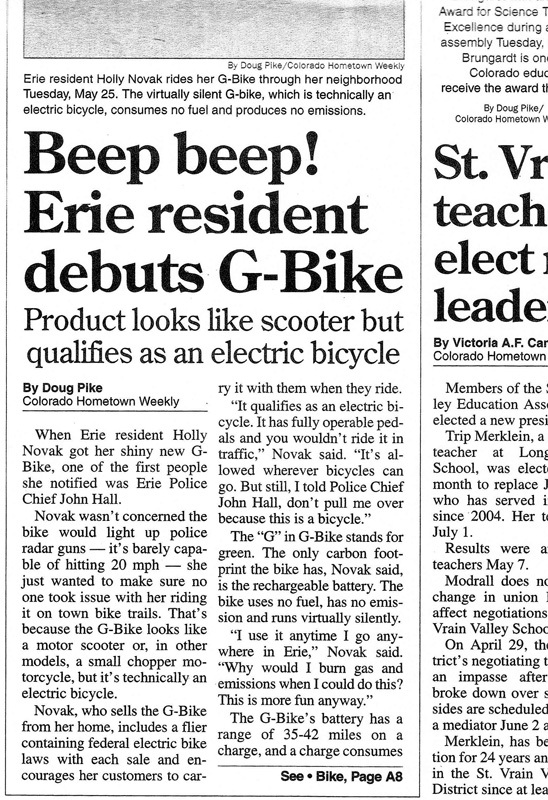 When Erie resident Holly Novak got her shiny new G-Bike, one of the first people she notified was Erie Police Chief John Hall. Novak wasn't concerned the bike would light up police radar guns-it's barely capable of hitting 20mph-she just wanted to make sure no one took issue with her riding it on town bike trails. That's because the G-Bike looks like a motor scooter or, in other models, a small chopper motorcycle, but it's technically an electric bicycle. Novak, who sells the G-Bike from her home, includes a flier containing federal electric bike laws with each sale and encourages her customers to carry it with them when they ride. "It qualifies as an electric bicycle. It has fully operable pedals and you wouldn't ride it in traffic," Novak said. "It's allowed wherever bicycles can go. But still, I told Police Chief John Hall, don't pull me over because this is a bicycle." The "G" in G-Bike stands for green. The only carbon footprint the bike has, Novak said, is the rechargeable battery. The bike uses no fuel, has no emissions, and runs virtually silently. "I use it anytime I go anywhere in Erie," Novak said. "Why would I burn gas and emissions when I could do this? This is more fun anyway." The G-Bike's battery has a range of 35-42 miles on a charge, and a charge consumes an estimated 29 cents' worth of electricity. Battery life can be extended depending on how much the rider wants to pedal, though at 155 pounds the bike isn't designed to run on pedal power alone. "This is perfect for bike commuters who don't want to take a shower when they get to work," Novak said. "If you don't want to work up a sweat on this bike, you don't have to." Novak said she also has fielded a lot of questions from parents looking for transportation options for their children who are too young to drive a car. The G-Bike, which made its debut months ago, features rear foot pegs to accommodate a second rider, but has a combined weight limit of 330 pounds. It rides on 16-inch tires and comes in green, pink, yellow, black, blue and white, and red and white. The chopper version comes only in cherry red. The G-Bike price tag comes in at less than most intermediate road or mountain bikes. The City model is priced at $1,099, while the Chopper retails for $999. Novak partnered with her brother Travis Morphew, who runs a G-Bike business in Los Angeles and may soon open a storefront in Hollywood. Morphew recently hand-delivered five G0Bikes to the Planet Hollywood suite of reality television star Holly Madison. Morphew taught Madison and the cast of her current reality show, "Holly's World," how to ride the G-Bike. The training was filmed and could appear in an upcoming episode. 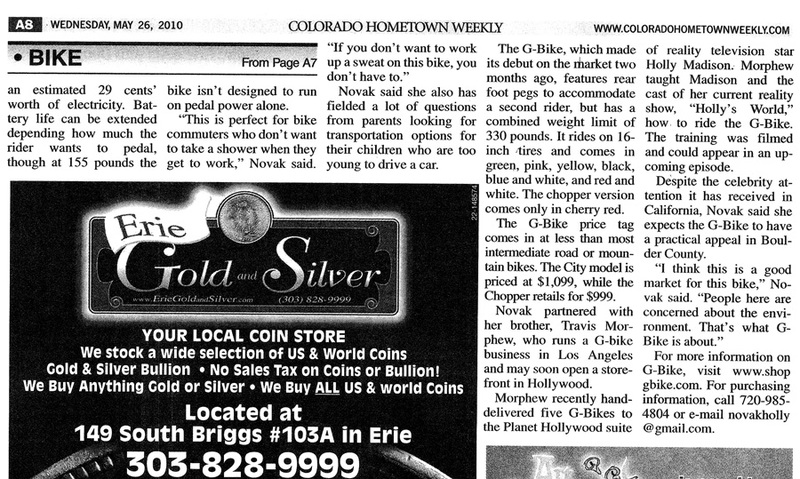 Despite the celebrity attention it has received in California, Novak said she expects the G-Bike to have a practical appeal in Boulder County. "I think this is a good market for this bike," Novak said. "People here are concerned about the environment. That's what G-Bike is about." For more information on G-Bike, visit www.shopgbike.com. For purchasing information call 720-985-4804 or email novakholly@gmail.com.